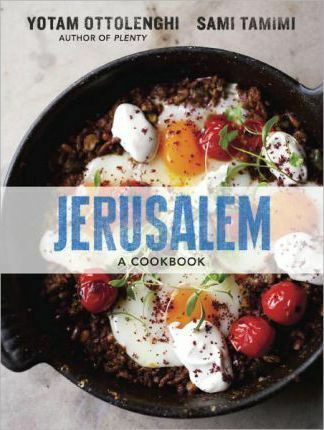 A collection of 120 recipes exploring the flavors of Jerusalem from the New York Times bestselling author of Plenty, one of the most lauded cookbooks of 2011. In Jerusalem, Yotam Ottolenghi and Sami Tamimi explore the vibrant cuisine of their home city--with its diverse Muslim, Jewish, and Christian communities. Both men were born in Jerusalem in the same year--Tamimi on the Arab east side and Ottolenghi in the Jewish west. This stunning cookbook offers 120 recipes from their unique cross-cultural perspective, from inventive vegetable dishes to sweet, rich desserts. With five bustling restaurants in London and two stellar cookbooks, Ottolenghi is one of the most respected chefs in the world; in Jerusalem, he and Tamimi have collaborated to produce their most personal cookbook yet. "The best cookbooks are the ones with a strong sense of place--and this is one of them. Yotam and Sami thoughtfully explore the way a tapestry of cuisines comes together into the vibrant, bold, and unique foodscape of Jerusalem. It's a volume that makes you want to cook. It makes you want to eat. And it makes you want to travel." --Heidi Swanson, author of Super Natural Every Day "Oh, my goodness, book my flight right now! The passion, the history, the photography, and oh, the food. -I didn't think it was possible, but Ottolenghi has outdone himself with Jerusalem." --Suzanne Goin, author of Sunday Suppers at Lucques "Jerusalem is a city of mosaics. Everybody takes and leaves their own impression. Yotam Ottolenghi and Sami Tamimi have beautifully and lovingly captured their corner of the city and its foods; Jerusalem is infused with Middle Eastern flavor and Plenty's gorgeous, rustic sensibilities." --Joan Nathan, author of The Foods of Israel Today "People say that food, like soccer, erases differences--that sharing salt creates a bond. In Jerusalem, Sami and Yotam, brought up on opposite sides of the same city, imagine a cuisine fed by a single wellspring. This book is not just a beautiful story of the Palestinian and Israeli dishes with which the authors each grew up, but a covenant of salt in which spiced chickpeas, fried rissoles, mint tea, and pomegranates represent a culinary fantasy where land and culture meld instead of diverging, and communities in conflict share a palate, traditions, and a love for the foods of a rich, storied, unified city." --Tamar Adler, author of An Everlasting Meal "Jerusalem is a beautiful and necessary book. I'm going to need three copies: one for the bookshelf, one to display on the coffee table, and one to be left open on the kitchen counter. (Not to mention the few dozen copies to give as gifts.)" --Jonathan Safran Foer, author of Eating Animals "Once more we are fortunate to receive from Yotam Ottolenghi a book that is filled with passion, color, and truly vibrant and fresh ideas. I am smitten and grateful!" --Deborah Madison, author of Vegetarian Cooking for Everyone "The book weaves in the wonderful mixture of countless cultures and historical events that have influenced the city's cuisine for centuries...I love all the snippets of childhood memories and mini history lessons sprinkled over the pages of Jerusalem, amongst 120 approachable recipes - both vegetarian and non-vegetarian, but all oh so enticing." --Marissa Lippert, nourish-nyc.com "The book is gorgeous, perfect to work your way through one recipe at a time." --Food52 "These vibrant recipes are spice-heavy, vegetable-forward, and consistently delicious." --Bon Appetit, September 2012 "It's a cookbook that's not only timely but also deeply personal. And seen through the eyes of two expats (both men live and work in England)--one Jewish, the other Palestinian--you're exposed not only to the simplicity of flavors but also to the complexities of food as politics. That food can be this charged might be surprising for some, but that it's so delicious is undeniable." --Epicurious.com "Written as homage to the city that defines the authors, this cookbook offers snapshots of the multicultural, multiflavored city that is Jerusalem. Realizing the difficulties of trying to capture the diversity of a city that has been described as "the center of the universe" Ottolenghi and Tamimi only promise "a glimpse into [the] hidden treasure" of a city constructed upon centuries of fusion, or the lack thereof, of hundreds of cultures being mashed together in such a small space. Not wanting to offend the inhabitants of an already disputed territory, the authors try to cut a cross-section of recipes and ingredients native to the inhabitants of Jerusalem. From Tunisia (shakshuka) to Turkey (Swiss chard fritters) and Iran (broad bean kuku) to Lebanon (the delicious hummus kawarma), this cookbook promises to excite the taste buds of anyone interested in Middle Eastern cuisine. Not happy with just presenting the flavors and textures of the city, the authors try to encapsulate the history and spirit of the city, too. With multiple introductions at its front, explanations of different spices and ingredients, and anecdotal stories peppered throughout, this book offers not only taste but education as well." Yotam Ottolenghi arrived in the UK from his native Israel in 1997 and set out on a new career in food, after having completed an MA in Comparative Literature whilst working as a journalist in Tel Aviv. In London he attended The Cordon Bleu after which he worked as a pastry chef in various establishments. In 2002, Yotam and his partners set up Ottolenghi, a unique food shop offering a wide range of freshly made savory dishes, baked products and patisserie items. There are now four Ottolenghi's, as well as NOPI, a brasserie style restaurant in Soho, London. Since 2006 Ottolenghi has written a column in The Guardian's Weekend Saturday magazine. He is the author of the New York Times bestselling books Plenty, Jerusalem, and Ottolenghi. SAMI TAMIMI is a partner and head chef at Ottolenghi and coauthor of Ottolenghi: The Cookbook.